Click the map to see all homes for sale by subdivision. Updated every hour. The Country Club Village is a guard-gated community within DC Ranch, and features one of the Southwest’s finest private membership clubs, The Country Club at DC Ranch. The prestigious Country Club Village community includes luxury villas, single-family and custom homes from leading builders, designed with a range of sizes, styles, floor plans and features. Enter the Country Club Village through one of two guard gated entrances on the North side of Thompson Peak Parkway. 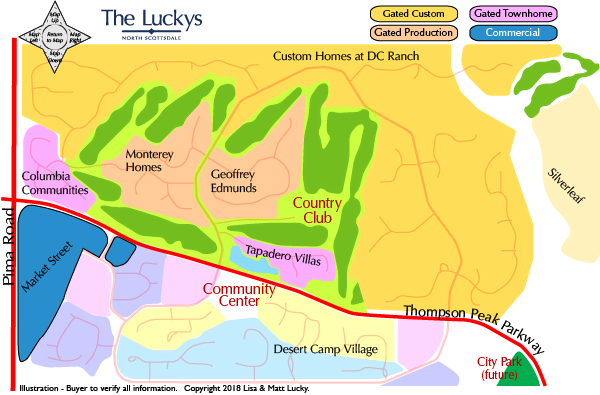 The Luckys have been members so ask them about The Country Club at DC Ranch. The Country Club at DC Ranch is a private club. Golf membership is limited and by invitation only. The 45,000-square-foot Ranch Hacienda style clubhouse serves an active membership in a casual-yet-elegant environment. In addition to golf, The Country Club boasts a broad array of amenities for all ages and members of the family, including swimming, tennis, fitness, dining and a variety of social activities. See all Country Club Village New. See all Country Club Village Sold.